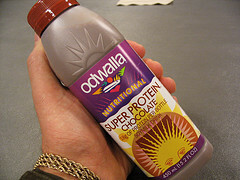 At the Whole Foods Market near my W2 labor camp, an Odwalla Shake is about US $4. This shake and a vegan cookie (mentioned earlier in this Blog) make my breakfast about $6. This implies that $30 can be spent weekly on my W2 breakfast alone! Not only is the cost unacceptable but the saturation of soy as a protein source is also unacceptable. Eventually, I get ‘tired’ of eating so much soy. My current solution to this problem is to make a breakfast drink with various powdered protein sources. The nutrition design problem here is that my powdered protein source is, yes, soy protein. To violate the sense of vegan purity, my non-soy alternative has been to use micro-filtered whey protein powder in my home-made breakfast shakes. A few days ago, my licensed TCM practitioner, Doris-Owanda Johnson, reminded me of rice-based protein powder. 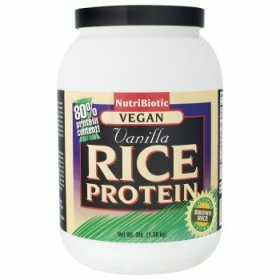 This leads me to experiment with Nutribiotic—Rice Protein (Vegan). This happens to be on the shelf (currently) at Whole Foods. My family background educated me and physically conditioned me to find food prepared at home superior to food that is “served” for money. It was not hard because the home-cooked meals from my past compete and exceed the taste test against commercial food. Experience tells me that the previous sentences mean I’m not from New York. My mother, my father and my older brother cook better than anything served to me with a glass of ice water on the street. This heavily influences my resentment of having to leave my kitchen to sit in some stupid office and write code. I’m literally paying for the ‘privilege’ to make money. Show me the way how to be an effective activist for telecommuting and you have won a crusader against unnecessary work-related commuting. Only a few people in the world can look down on a traffic jam from private jet and know that they are making money every second those cars sit in gridlock. So, speaking of taste, try your protein powder blended with bananas, honey and almond milk. Another variation (that introduces soy again) is your protein powder with bananas, honey and soy milk. You can thicken with creamy almond butter and sweeten with indigenous American agave nectar—these options are expensive (but still cheaper than dropping $30 for Odwalla and a cookie weekly). My style is to drink my shake with toast swathed with almond butter or soy butter. This breakfast is hearty enough to get me to lunch. And remember that my taste buds grew up with something called Orange Julius up off in Fox Hills Mall—no painful, miserable sacrifices for so called “health food” are being made here! Next Next post: Another feel-good sales pitch: When you take stuff out, put it back!